On Wednesday, November 30, 2011 the Santa Ana winds blew through Pasadena and quickly made downtown look like Armageddon. Don’t believe me, take a look at these photos. We lost electricity at Unconventional Media, but it didn’t matter, I wasn’t working. The electricity was out at the home of my sister, Lindsay Mofford and her husband, Tucker. 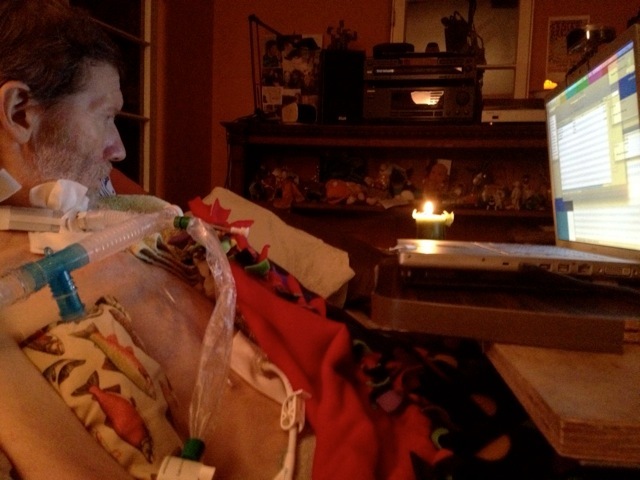 I’ve written on this blog about Tucker Stilley before, his battle with ALS (amyotrophic lateral sclerosis, also known as Lou Gehrig’s disease) and without use of any of his muscles, outside of his neck and eyebrows, his ability to create artwork and interactive media with just a reflective bindi-dot on his forehead that controls a complex system of computer technology. Back to the power that went off that evening and did not return for 63 hours, a stretch that could have proven deadly to Tucker. He now breathes 24 hours a day with the assistance of a ventilator. When the electricity went off, everyone had to kick into emergency mode and that’s what amazed me. Not only how quickly the family and caretakers reacted, but how the community of fans and friends stepped in to assist. There was a news piece about the situation in the Pasadena Star News. Now, there have been other postings about the community of support and friendship for Tucker, including an episode on the radio program, Humankind and a blog on Indiewire a couple years back. There is even a website entitled, All Hands on Board, that links supporters and friends to updates on the artist and new work and most importantly, to each other. Even a Facebook site. But as medical needs grow, people are now not only giving money as a tax deduction, but also donating their own art to be sold in a community marketplace with all finances raised supporting Tucker. I’m amazed at not only Tucker’s art work that is available for purchase but all the other great things. This Community Page continues to grow with so many possibilities, it’s one stop shopping for the holidays. You must see it. I’ve got my film Travelin Trains up there. My mom has her new book, “The Devil Made Me Do It.” The incredible musicians, Alloy Orchestra, have a few of their original movie soundtracks available including, “Man with a Movie Camera.” Beautiful prints. Bardo scarves. Even stays in Florence, Italy and Cambridge, Mass. More gets added every day. At times he describes himself as a “brain in a jar,” but it is a brilliant brain. We thank you all, those supporters that are consistently involved in Tucker’s life, but as his neck and shoulder muscles begin to give, we are reaching out to new medical procedures like the Eyewriter and more medical staff to keep the “brain” creating. We need to go beyond the community that knows Tucker and introduce him to those who have yet to meet him. I believe the Community Marketplace is a good starting point. Please share, buy and donate.